An authentic bubblegum colored vivid pink topaz stone from Apples of Gold Jewelry adds a twist to this stunning engraved heart band pink topaz ring! 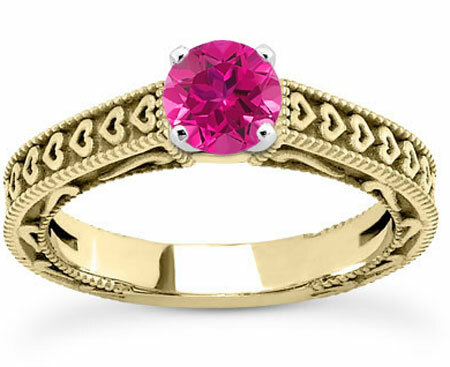 the 6.5mm stone is situated on a 14K yellow gold ring that features many small hearts going around the band, creating a sweet look that is only enhanced by the round, AA rated pink topaz gemstone. Take yourself back to days at the fair or the first dates with your sweetie with this romantic engagement ring! We guarantee our Engraved Heart Band Pink Topaz Ring, 14K Yellow Gold to be high quality, authentic jewelry, as described above.